Airline wants to fly up to 30 jets out of the island airport; asking the municipal and federal governments to change the rules to permit this. Photo by syncros from the Torontoist Flickr Pool. 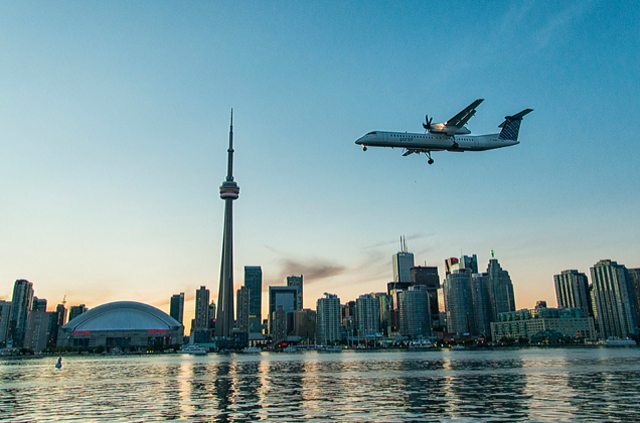 Since its launch seven years ago, Porter has made its mark in Toronto by focusing on short flights and a slick profile. With a raccoon logo and well-styled uniforms, it has won over many local residents who initially resisted the idea of having flights come in and out of the island airport, concerned about disruptions to those who live by or come down to enjoy the waterfront. Those concerns have ebbed somewhat, in the wake of well-delivered service, though there are still some complaints about the noise and the traffic effects. Today Porter unveiled a major expansion proposal, one which may put many of those concerns back on the front burner. That proposal includes flying up to 30 jets out of the island airport, going to up to 14 new destinations, by 2016. As first reported by the Wall Street Journal yesterday, the airline has placed an order to buy up to 30 jets from Bombardier; a purchase valued at approximately $2 billion. Porter is billing these planes as “whisper jets” and maintains they will create less or comparable noise relative to the turboprops they are already flying out of the island. 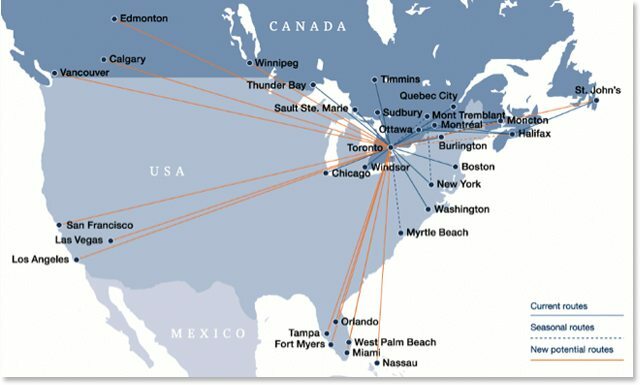 The jets will enable Porter to offer longer-haul flights: among the 14 new routes on their list are Edmonton, Calgary, and Vancouver, as well San Francisco, Las Vegas, Los Angeles, and for snowbirds, five cities in Florida. In a website created specifically to explain its proposal, Porter still calls the island airport its “main operating base.” When news of the Bombardier purchase came out yesterday, some had speculated that Porter might seek to fly those jets out of Pearson; today Porter indicated no such interest. What they did do is outline two changes they are requesting to the regulations which currently govern the island airport; taken together they would enable Porter to fly the jets out of downtown. The island airport is governed according to rules set out in a tripartite agreement between the federal government, the municipal government, and the Toronto Port Authority [PDF]. That agreement is currently set to expire in 2033; Porter will therefore need to convince all signatories to the agreement to reopen it two decades ahead of schedule. Early signs at City Hall were not looking good for Porter: immediately upon hearing the news of Porter’s proposal several councillors came out in opposition to it. Even Rob Ford’s newly appointed budget chief, Frank Di Giorgio (Ward 12, York South-Weston) said that his gut instinct was that jets don’t belong at the waterfront. Vaughan also took issue with the technical details of Porter’s proposal, saying that what they’ve outlined is just the length of the runway extension they’d need; it doesn’t include an internationally mandated “safety apron,” which would require a further extension. Chair of the Public Works and Infrastructure Committee, Denzil Minnan-Wong (Ward 34, Don Valley East) didn’t express a definite view, saying that council would need to “carefully consider” the proposal. He did say that if the airport is expanded, it probably won’t be just Porter making use of the extra runway space—other airlines would be able to apply to use it as well, and their jets might not be as quiet as the ones Porter is buying.